Bright color lanterns, music in the air, dancing in the street, and food vendors on every corner: it points to festival time. Kyoto Gion Festival stretches for the month of July, climaxing with a parade of 32 floats that can measure up to 25 feet tall, weighing 12 tons. 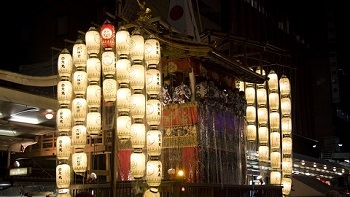 It is easily considered as the largest and best festival in Japan. Starting from Tokyo, our Gion Festival Tour will travel south to Hakone, Nara and a prolonged stay in Kyoto. We will visit famous landmarks like Asakusa, Todaiji Temple, and the Golden Pavilion. 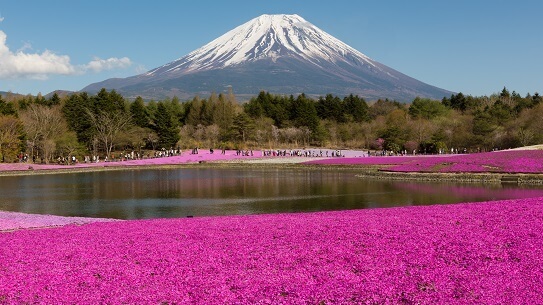 With this exciting tour package, you will experience tea ceremony, sake tasting, and a scenic ropeway ride in Hakone with a breathtaking view of Mt. Fuji. Isolated deep in the western mountain, there is a Little Kyoto where the festival lights illuminate the night and music fills in the air. 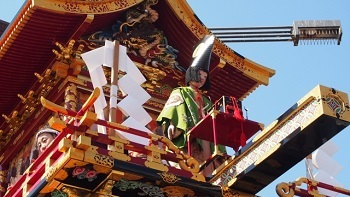 Takayama festival is considered to be one of the three most beautiful festivals in Japan. Their huge floats are paraded all day and night with mechanical puppet shows, brilliant color paper machete, and lanterns. This fully escorted Takayama Festival Tour takes you to the West side of Japan, exploring Kyoto, Kanazawa, Takayama festival, Shirakawa-go, Matsumoto, Hakone, Mt. Fuji, and Tokyo. You will get to experience tea ceremony in a Buddhist Temple, see breathtaking views of Mt. Fuji, and walk along a rural gassho village. If you want to be part of the fun… just follow the taiko drums! You can also extend your vacation before/ after the tour in Tokyo, Osaka, and Kyoto. The Gion festival in Kyoto is the largest in Japan having hundreds of food vendors, carnival games, activities, parade, art display, and more. This fully escorted Japan tour will travel from Tokyo to Hakone, Nara, Hiroshima, Miyajima, and a prolong stay in Kyoto. We will visit the latest trend in Harajuku, see the Big Buddha at Todaiji Temple, and be awe-struck by the Golden Pavilion. With this exciting Kyoto Gion Tour with Hiroshima package, you will experience tea ceremony, sake tasting, and a scenic ropeway ride in Hakone with a breathtaking view of Mt. Fuji. You will also get familiar with Japan’s hot springs in a luxurious ryokan, Japanese hotel, with a traditional Japanese multi-course dinner. It is a great cultural experience especially being part of a Japanese festival and visiting UNESCO’s Hiroshima Peace Park and Miyajima’s floating torii. You can also extend your vacation before / after the tour in Tokyo, Osaka, and Kyoto. In a town called Takayama, isolated deep in the western mountains, a great Japanese festival takes place every year, lighting up the night and filling the air with wonderful music. Takayama Festival, considered one of Japan’s three most beautiful festivals, is a parade of huge floats with mechanical puppet shows day and night, covered in intricate color paper machete and stunning lanterns. This fully escorted Takayama Festival Tour with Hiroshima package takes you from Tokyo’s Asakusa Sensoji Temple to Hiroshima’s Peace Memorial Park and A-Bomb Dome to understand Japanese history. On our way to Hiroshima we will be making numerous trips to other cities including Hakone, Lake Kawaguchi, Nagano, Takayama, Kyoto, Nara, Osaka, Himeji, and Miyajima. From great views of Mt. 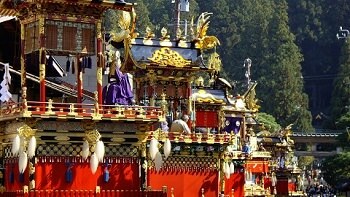 Fuji in Hakone to Kyoto’s countless treasures of Golden Pavilion and Fushimi Inari Shrine, this tour cannot be missed. This Takayama Festival Tour with Hiroshima package will also offer the chance to participate in an authentic Japanese green tea ceremony during this trip. In Takayama, you will see the great festival not once, but twice, both day and night to experience the festival in both environments. The catchy tune of drums and bright lights from the lanterns will surely get you dancing. 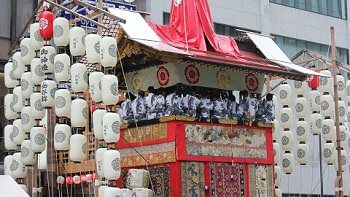 This Takayama Festival Tour is filled with rich and meaningful experience that runs deep to Japan’s history. You can also extend your vacation before / after this Takayama Festival Tour in Tokyo, Osaka, Hiroshima, and Kyoto. 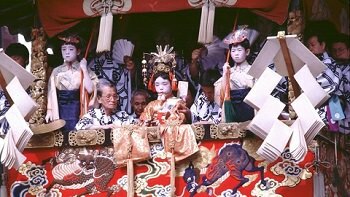 The Gion festival in Kyoto is the largest festival in Japan having hundreds of food vendors, carnival games, activities, parade, art display, and more. This fully escorted festival tour package will travel from the largest metropolis city, Tokyo to Kyoto where the infamous Gion festival is held, to Hiroshima where you will learn about the city's historical significance and Osaka, Japan's economic center with delicious food. This grand tour also features a visit to Kyushu, southern Japan. With so much to do in Kyushu, we have fit in our itinerary a trip to UNESCO’s floating torii in Miyajima, Nagasaki’s Glover Garden, The Tour of Hell in Beppu, a soak in the hot springs of Dogo Onsen and more. With this exciting Grand Gion Festival Tour package, you will experience tea ceremony, sake tasting, a Kimono Fashion Show,a cruise in Lake Ashi with a breathtaking view of Mt. Fuji, and much more. You will also get familiar with Japan’s hot springs in a luxurious ryokan, Japanese hotel, with a traditional Japanese multi-course dinner. It is a great cultural experience especially being part of a Japanese festival and visiting UNESCO’s Hiroshima Peace Park and Miyajima’s floating torii. You can also extend your vacation before/ after the tour in Tokyo, Osaka, and Kyoto. Travel Japan extensively by stopping at three major islands – Honshu, Kyushu, and Shikoku- with an added bonus of participating in Takayama Festival, one of Japan’s most beautiful festivals. This Grand Takayama Festival Tour takes place during the breathtaking Fall season, as all the leaves begin to change colors to wonderful hues of red and orange. 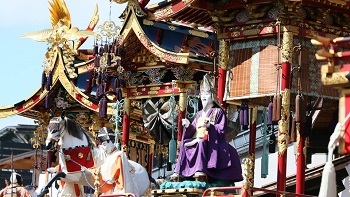 This fully inclusiveGrand Takayama Festival Tour package is filled with an assortment of experience from the metropolis city life to the off beaten track of Japan’s countryside including a visit to Takayama Festival. Starting from Tokyo, the tour travel south to Hakone, Nagano, Takayama, Kyoto, Osaka, Himeji, Hiroshima, Miyajima, Beppu, Matsuyama, Takamatsu, and Tokushima. This Grand Takayama Festival Tour will offer to experience Japanese green tea ceremony in at a temple in Kyoto, enter the Tour of Hell in Beppu’s hot springs, and see breathtaking views of Mt. Fuji. The tour will visit famous landmarks throughout our journey including the Golden Pavilion, Shirakawago, Fushimi Inari Shrine, Hiroshima A-Bomb Dome, Itsukushima Shrine, and more. You will also get familiar with a luxurious ryokan, Japanese hotel, with hot springs and a traditional Japanese cuisine. You can also extend your vacation before / after the tour in Tokyo, Osaka, and Kyoto.